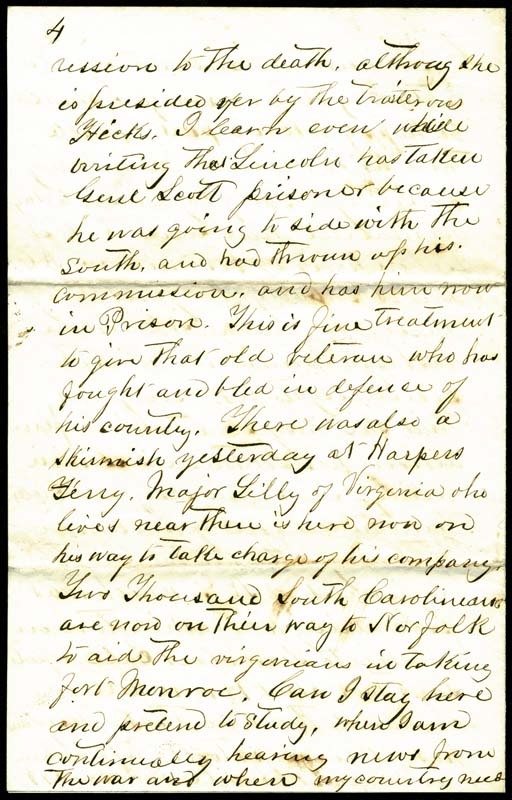 Item citation: From folder 1 of the Julien Dwight Martin Papers, Southern Historical Collection, Wilson Library, University of North Carolina at Chapel Hill. To day again I went to the office, but no letter was there to cheer my spirits, by telling me to come home and hasten to the war. I was anxiously expecting one, and the disapointment went quite hard. The Orange Guards left Hillsboro this morning, and I am told that there were few dry eyes in the crowd congregated to see them depart. There was parting with wives and children fathers and brothers, and with some no doubt a parting for the last time. There was a flag raising here to day. The ladies of the place made and put up the Flag. The citizens raised the pole in which I had the pleasure of assisting. Two young ladies made speaches and were followe by the following noted gentlemen, S. F. [Samuel Field] Phillipps, Capt Ashe, Gov Swain and Sidney Smith, together with quite a number of Students. 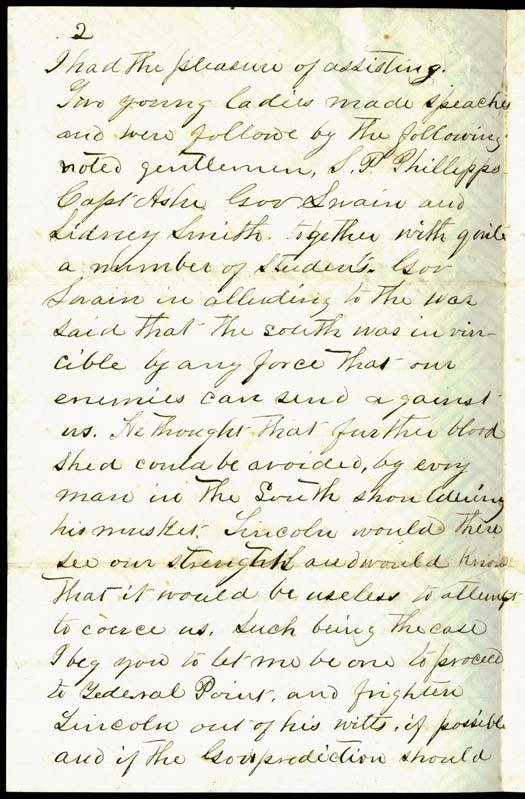 Gov Swain in alluding to the war said that the south was invincible by any force that our enemies can send against us. He thought that further blood shed could be avoided, by every man in the South shouldering his musket. Lincoln would then see our strength and would know that it would be useless to attempt to coerce us. Such being the case I beg you to let me be one to proceed to Federal Point, and frighten Lincoln out of his witts, if possible and if the Gov’s prediction should prove untrue and war should actually be necessary, I should be happy to bear a part, humble though it be, in defense of my country. The flag raised to day contained nine stars, the last two in honor of Virginia and N. C. This is probably the first flag raised, on which N Carolina has been numbered with the seceeding states. God grant that she may soon take her place among her southern sisters in reality. 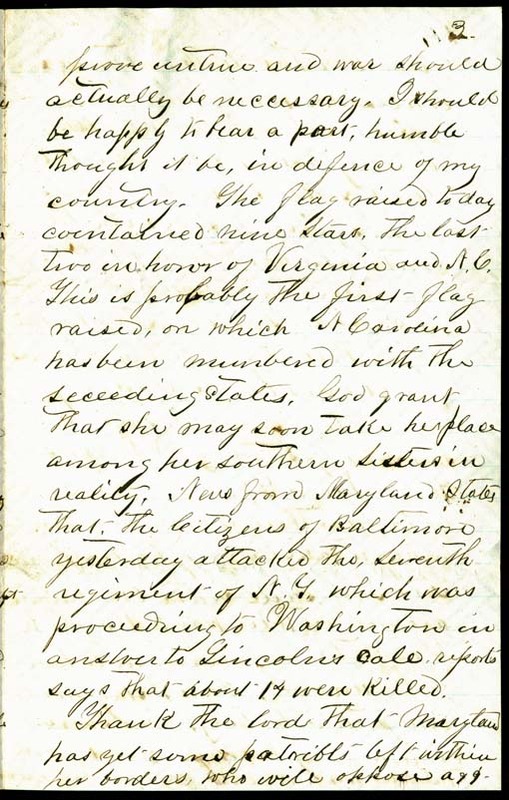 News from Maryland states that, the citizens of Baltimore yesterday attacked the Seventh regiment of N. Y. which was proceeding to Washington in answer to Lincoln’s call. reports says that about 14 were killed. Apr 21st since writing this letter I have heard that fortress monroe is taken, that Gov Ellis has caled out thirty thousand troops. There is a company formin[g] here to go to Washington City, composed of students. As my state needs my services I shall not volunteer. Please write to Capt Cowan immediately and see if he will except me. I am copelled to go somewhere. Another of my classmates Lyon of Edgecombe leaves tomorrow morning. Several will leave during the week. This entry was posted in Southern Historical Collection and tagged Chapel Hill, David Swain, Edward Hall Armstrong, Hillsborough, Julien Dwight Martin, Orange Guards, Orange Light Infantry Brigade, secession, students, University of North Carolina. Bookmark the permalink. This is simply terrific. You can see in this letter the results of hours and hours of male student groupthink — not that the rest of the region was much different. Makes you want to shout down the years, doesn’t it? True. Seems that most UNC students were pretty hawkish that spring. Tomorrow’s post (22 April) offers a nice comparison. It comes from another UNC student, John W. Halliburton, who talks about the same event (we believe) where students and faculty gave speeches. Halliburton claims himself to be anti-secessionist (but “anti-Lincoln” in another letter) and describes a pro-Union speech that he delivered at this rally. Even so, Halliburton later ended up serving in the Haywood County (TN) Grays of the CSA. It’s never cut and dry, is it? 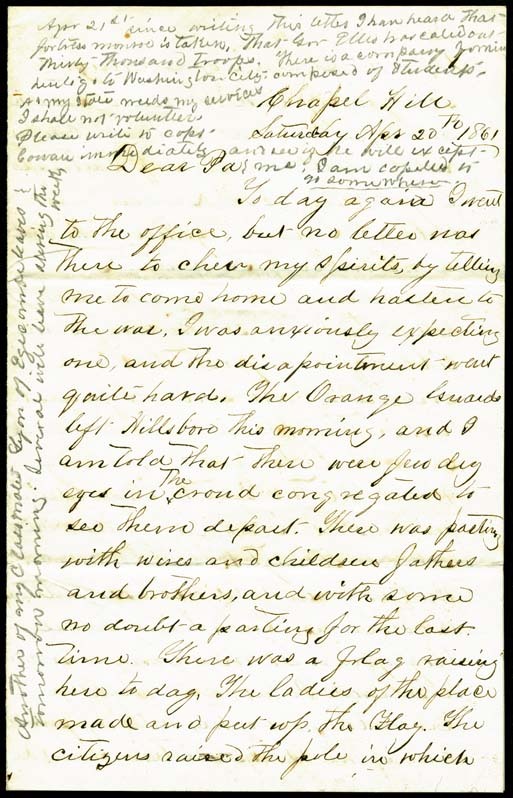 Interesting that this letter and the diary from yesterday both contain rumors about Winfield Scott who headed the US Army at that time. Scott wasn’t imprisoned, as this writer says, nor does he quit and join the South as yesterday’s author believed. Instead he retires in November and never joins the CSA although he hailed from Virginia. Facinating how active the rumor mills were.